Gulmarg Gondola- The second highest cable car in the world. Gulmarg boasts Asia’s highest and longest cable car project.The two-stage ropeway ferries about 600 people per hour to and from Kongdoori Mountain, a shoulder of nearby Afarwat Peak (4,200 m (13,780 ft)). Tsomoriri or Lake Moriri is a lake in the Changthang area in Jammu and Kashmir. The lake is at an altitude of 4,595 m; it is the largest of the high altitude lakes in the Trans-Himalayan biogeographic region, entirely within India. The lake sits between Ladakh, India to the North, Tibet to the east, and Zanskar in the west. PAHALGAM – The Valley of Shepherds. Situated at the confluence of the streams flowing from Sheshnag Lake and the Lidder river, Pahalgam (2,130 m) was once a humble shepherd’s village with breathtaking views. Now it is Kashmir’s premier resort, cool even during the height of summer when the maximum temperature does not exceed 25 deg C. A number of hotels and lodges cater to all preferences and budgets, from luxurious hotels to unpretentious trekkers’ lodges, including J&K TDC huts. Jammu and Kashmir is the northernmost state of India. Jammu is noted for its scenic landscape, ancient temples and mosques, Hindu and Muslim shrines, castles, gardens and forts. 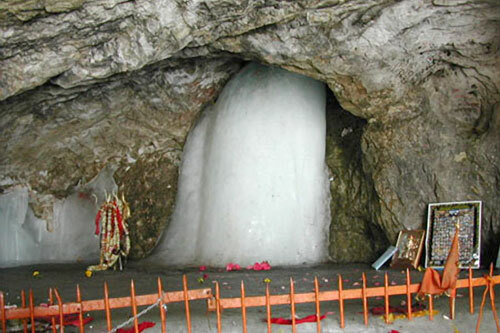 The Hindu holy shrines of Amarnath in Kashmir Valley attracts about .4 million Hindu devotees every year. Vaishno Devi also attract millions of Hindu devotees every year. Jammu’s historic monuments feature a unique blend of Islamic and Hindu architecture styles. Tourism forms an integral part of the Kashmiri economy. Often dubbed “Paradise on Earth“, Kashmir’s mountainous landscape has attracted tourists for centuries. Notable places are Dal Lake, Srinagar Pahalgam, Gulmarg, Yeusmarg and Mughal Gardens etc. Kashmir’s natural landscape has made it one of the popular destinations for adventure tourism in South Asia. In recent years, Ladakh has emerged as a major hub for adventure tourism. This part of Greater Himalaya called “moon on earth” consists of naked peaks and deep gorges. Leh, the capital, is also a growing tourist spot. Named after Raja Udham Singh, Udhampur city is the second-largest city in Jammu region. Set amidst lush green surroundings and fringed by eucalyptus trees, Udhampur is one of the best tourist attractions in Jammu & Kashmir. A delight for history lovers, the city offers many relics dating back to the time of epic of Mahabharata. The Krimachi group of temples are said to be the oldest structures in the city. Udhampur is also famous for the underground river Devika, which is considered the sister of Ganga. Visit the Ramnagar fort, located approximately 40kms from Udhampur and built by Raja Suchet Singh. Moungri Cave shrine, Pingla Mata and Sudh Mahadev temple are other prominent places that must be visited in Udhampur.ath cave on challenging mountainous terrain to see an ice stalagmite formed inside the cave. Dal is a lake in Srinagar (Dal Lake is a misnomer as Dal in Kashmiri means lake), the summer capital of Jammu and Kashmir. The urban lake, which is the second largest in the state, is integral to tourism and recreation in Kashmir and is named the “Jewel in the crown of Kashmir”or “Srinagar’s Jewel”. The lake is also an important source for commercial operations in fishing and water plant harvesting.